A few years ago I had the bright idea to put an OCUS moving cache inside a typical GC cache in the hopes that someone would find it, check out the site and move it. I even made it a travel bug to make it easy and more tempting. Well The Infiltrator has had a storied life (check out the Blog story on it) but has only been placed in four caches that I can recall. The first was the one I put it in. Second was a "wormhole" cache to get it moving out of state to another area of activity. Third was the cache it was placed in at the other end of the "wormhole". Now it sits in the Michigan area waiting to be found. Most of the time it is the hands of a limited number of people that just hang on to it and show it about with few resulting logs. At least twice it has been held by an individual cacher for a year. On to 2015. While The Infiltrator sits I still think the idea of a moving cache hidden inside a larger cache on a slightly more popular site is a way to entice new cachers to explore the option of OCNA. I come up with the idea of saturation. Add several of these small moving caches scattered around my caching grounds to see what happens. I finally place a couple of my intended 6 OCNA mini-moving caches. After posting them I check out the "New Caches" list only to find that Bon Echo has done exactly the same thing with his Open Ambassador series a few months earlier. Now we just have to sit back and see what happens.....Are they picked up at all? Do they bring in new members? Do they languish in their captive caches? My hope is that they get a little action from time to time and get a few cachers to at least explore OCNA and possibly become active members rather than one time movers. Wonder hard it would be to have some trackables minted in China with the words "Trackable at OpenCaching North America" and publish them as moving caches? I know DG has a "moving BIT" on his cachemobile. That reminded me that I need to activate my BIT cache. One more sticker on the Toyota can't hurt. Any movement yet with your travelers? Of the three I created, only one has been released. i dropped it off at a large geocaching event (as a groundspeak trackable) and it was picked up and later dropped into a groundspeak cache. That was over a month ago. As an aside, the trackable tags I'm using are groundspeak HQ tags- we received four of them from a groundspeak lackey at a MEGA event last year and another three from the same lackey at a different event, 4 months later. I appreciated getting the trackables, and did send one of them out as a "typical travel bug'. But the others are just sitting there so now I have a purpose for them. Besides, if I stick a little figure on them and send them out they just end up being stolen anyway. That's why i will never buy another travel tag from groundspeak, they always go missing. We handed out 3 at an event on Jan 1 2013 and two of the three never made it out from the first taker. They were Christmas gifts to the kids, a travel bug race. the kids were pretty disappointed. 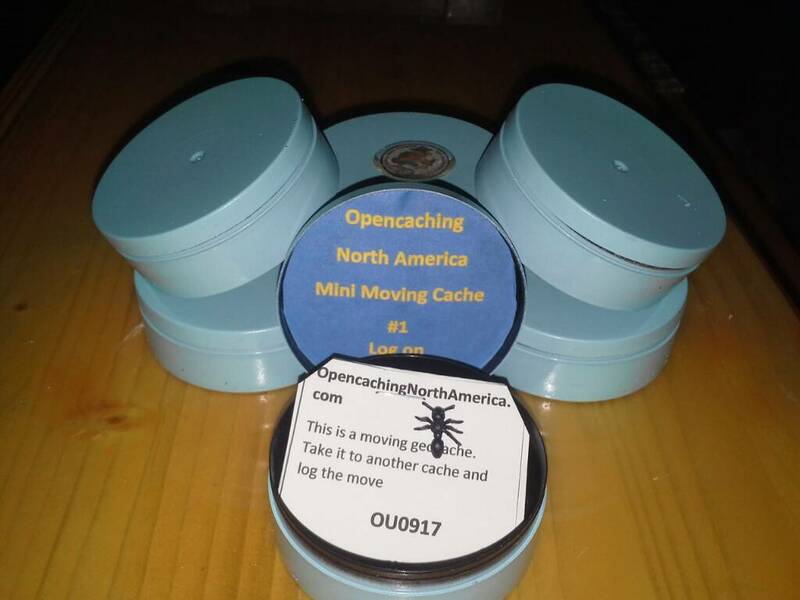 Of the 6 original mini moving caches 5 have been released. Only one has been moved by an existing OCNA member. One of them I suspect had been picked up simply due to its location at an interstate rest stop and the small size container which the mini cache completely filled. As far as I can tell so far the others and their host cache have not been found but I should probably put them on my watch list. After ithink entered a few logs while searching for some of the OCNA Mini Moving caches, it appears that they are being picked up by cachers but I have yet to get a single log. They could be taking them intending to check it out but don't, moving them without logging or just trashing them as inappropriate to be found in a competitors cache listing. I don't know but this attempt seems to be a failure. Without a GC dog tag this just fails in bringing in new OCNA cachers. Maybe I'm just different. I remember when I first started caching I immediately started searching the web for alternative cache listing sites to learn more. I found Navicache but it was already pretty much abandoned and the nearest was a good ways off but doable except the cross listing on GC was already archived as lost. Terracaching required the sponsorship by existing members which I didn't do for some time. Once I did I found there were very few nearby which I attempted but failed to find unless it was a virtual. If there had been more or the existing listings were actually still there I would have done more. TermiteHunter wrote: After ithink entered a few logs while searching for some of the OCNA Mini Moving caches, it appears that they are being picked up by cachers but I have yet to get a single log. They could be taking them intending to check it out but don't, moving them without logging or just trashing them as inappropriate to be found in a competitors cache listing. I don't know but this attempt seems to be a failure. Without a GC dog tag this just fails in bringing in new OCNA cachers. I had two moving caches listed here that I reconsidered and archived after taking one to an event and nobody would even log it as discovered. My caches cost about $12 to make plus the cost of the TB that was attached to them, so even the idea of using a GC dog tag did not work for me, and I'm not promoting OCNA anymore either. Especially by using geocaching.com's site to reach other geocachers, that's just wrong. When I joined the OpenCaching networks back in 2010 they looked like fun, and Garmin's OpenCaching soon turned ugly and unusable. Now, OpenCaching North America has become the site to list anything that can not be published on the official geocaching site because or their guidelines, such as proximity issues. I'd hate to see a cache listing that would be rejected here. I looked at NaviCache and TerraCache, which both have abandoned listings in the area. I guess I'm a little different because I archive my listings before I leave a site that I'm no longer interested. I do that as respect to my fellow geocachers. I do have a few vacation caches left here, but they are virtuals, which are also my listed Waymarks, and one web cam in a nearby veterans Park. But as for my two traveling geocaches that I listed here, both are archived and their missions changed not to reflect OCNA in any way and the one dropped in a TB Hotel at the Lincoln Museum near Cumberland Gap was picked up and was last logged in a cache near Tybee Island, GA. It's good to see it moving. I have to agree with you, at least to some degree that using GC caches to reach cachers is wrong.